Harry Maguire bagged a superb late winner for Leicester City against Southampton today, a strike that saw some Man United fans regret seeing the club not sign the player this summer. 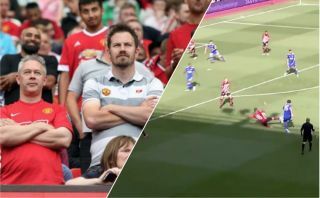 Maguire was a target for the Red Devils this summer as per the Metro, with the report also noting that the Foxes wanted at least £75M for the defender who shone with England at the World Cup in Russia. It was clear for all to see that United’s centre back pairing of Eric Bailly and Victor Lindelof struggled dearly during the club’s 3-2 loss to Brighton in the Premier League this last weekend. And now, following Maguire’s superb long-range strike for the Foxes this afternoon, a fair few United fans have taken to Twitter to exclaim their regret at not seeing Maguire move to Old Trafford this summer. The England star showed during his time with the Three Lions at the World Cup this summer that he has what it takes to cut it against some of the best attackers the world has to offer. And it’s fair to say he would’ve done a better job than Bailly at Lindelof of defending a striker like Glenn Murray in United’s loss to the Seagulls last week. Here are a few select tweets from fans wishing United would’ve signed the England international. And after his goal today, we can see why! Harry Maguire scoring the winner…take note @ManUtd we should have bought him! !